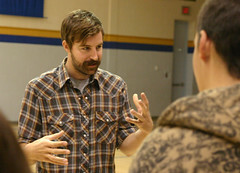 Director Dylan Reibling speaks with students about the filmmaking process. A group of DHS students were treated to a special screening of films today thanks to the Toronto International Film Festival. Emily Scheer of the T.I.F.F, along with Nick Wong, Dylan Reibling and Jim Foote were at DHS to present “Future Frames”, a collection of 10 films created at post-secondary film schools across the country. The films ranged from serious to light-hearted, and were created in a variety of mediums including live-action and computer animation. 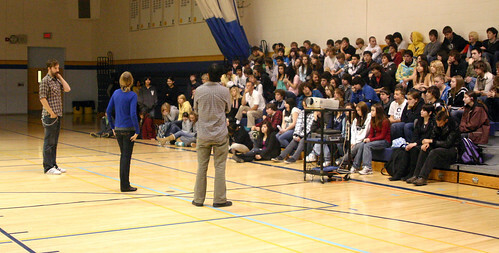 After viewing the films, the students had a chance to speak with the organizers (two of whom created films that were shown in the screening). The filmmakers were happy to answer questions about the production process, and how students could get involved in filmmaking. The T.I.F.F. group returns to DHS next Tuesday to work with a group of students in scripting, planning and shooting films of their own. Students were treated to a selection of films, followed by a Q&A session with the T.I.F.F. representatives.